You’ve seen it in movies: Teacher sits the parents down, says their kid is running a business out of an empty office on campus, a room the school staff presumed was used for storage. 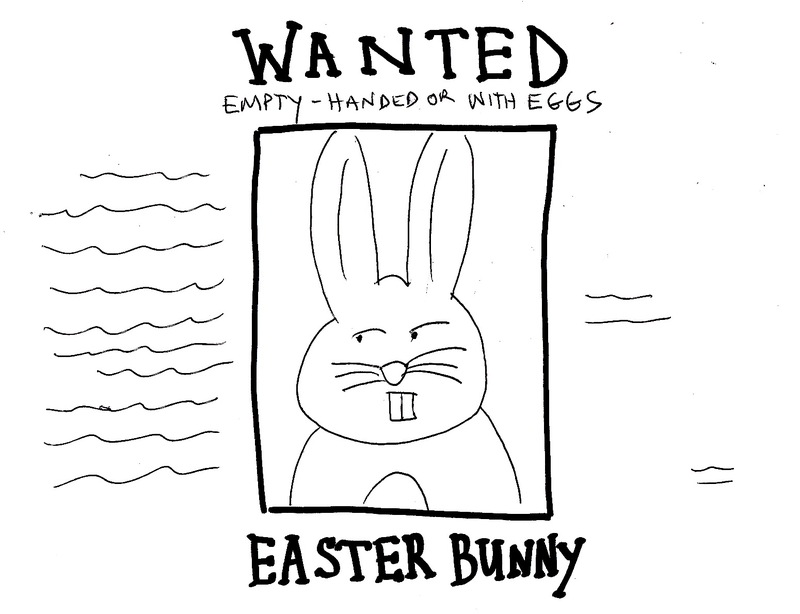 The kid’s business -- a secret operation to catch the Easter Bunny. Maybe you haven’t seen it in movies. But it runs through my mind as my wife and I prepare to meet with our 8-year-old son’s teacher the week before spring break. During the scene in my head, the teacher tells my wife and me that our kid has a crew for Operation Bunny under his command. On the wall behind the kid’s desk in “his office” is one of those motivational pictures with a climber at the peak of a mountain and, in big letters below the image, the words Ambition -- Aspire to climb as high as you can dream. I taught my son to go after what he wants. Maybe he’s a little too ambitious. That’s why I fear what his teacher has to say. What is my son up to? I wonder. I also know that, during this time of year, my kid has one obsession -- to catch the Easter Bunny. Maybe it’s because he wants to prove to his non-believer friends that Bunny does exist. Maybe it’s because Bunny is a trickster and my son doesn’t want to be tricked any longer. 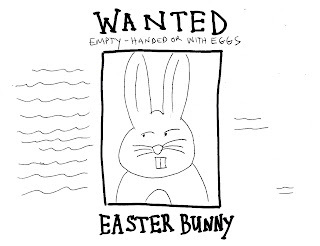 Maybe my son’s grown tired of Easter egg hunts and he wants one final, big score -- all of the Bunny’s Easter eggs. The day before the parent-teacher conference, my son tries softening us up. I remind the kid of the weight the words “I promise” carry, and I ask if he means it. He says he does, that he promises he’s been good in school. If he’s lying, that’s a huge deal in our world, and I won’t be happy. My wife and I enter the classroom. It smells like erasers and pencil shavings. We’ll be here for the next 30 minutes. By 4:30, I’ll know where our son stands. And I’ll know if his promise is good. The teacher -- he has nothing but shining things to say about our kid. Nothing about a secret office on campus. Nothing about Operation Bunny. Nothing even about our boy smuggling carrots or radishes (Bunny bait) from the cafeteria to his desk. I won’t say to the teacher, Huh? But I want to. Maybe he’s trying to soften us up. That’s it. He finally gets to the part about our son’s wandering mind, his constant questions unrelated to the subject being taught in class. But the teacher says our son is very imaginative, unlike any student he’s ever had. This guy’s clearly working for my son. How many Bunny eggs did my kid promise him? With good marks on his report card, my son’s situation is pretty good. In fact, it’s too good. I give the teacher a smile, one that means there’s really nothing to smile about. The teacher’s eyes go wide. Maybe he’s with me. Maybe he thinks I’m nuts. Maybe I don’t care either way. Before I can roll my son’s desk, the teacher assures me there’s nothing to worry about. My wife and I meet up with our son outside the classroom and tell him the good news about the conference. The boy seems relieved. That’s suspicious. But I offer ice cream -- not for him for doing well, but for me for making it through the conference without completely losing my obsessive-compulsive mind. After two scoops of mint chocolate chip and a Dixie cup of water, a hunch about my son’s previous suspicious behavior leads me to our fridge. Low and behold -- missing carrots! I knew he was leaving me out of the Bunny heist fun. I go to the kid’s room, tear it apart. I find the carrots. That’s right, the carrots from the fridge. Then I find a stick, twine and a box labeled Bunny Catcher 1027-Z, a hybrid of the model we made last year and the leprechaun trap we just made for St. Patrick’s Day. I confront my son. He gives me a story about wanting to catch Bunny without my help. My kid reminds me of the weight the words “I promise” carry. And now, per my promise, I have to deliver an Easter Bunny. You’ve seen it in movies -- father puts his foot in his mouth.